The Leadership in Energy and Environmental Design Green Building Rating Program is, in the words of the U.S. Green Building Council (USGBC), "a national consensus-based, market-driven building rating system designed to accelerate the development and implementation of green building practices. In short, it is a leading-edge system for designing, construction, and certifying the world’s greenest and best buildings." This statement at once reveals both the brilliance and the shortcomings of LEED for new construction in its current form – and points the way toward improvements that need to be addressed in its next iteration. LEED works so well, first of all, because it is simple to understand. LEED is divided into five categories related to siting, water conservation, energy, materials and indoor environmental quality, plus an innovation and design category. Each category contains a specific number of credits (see Figure 1); each credit carries one or more possible points (see Figure 2). 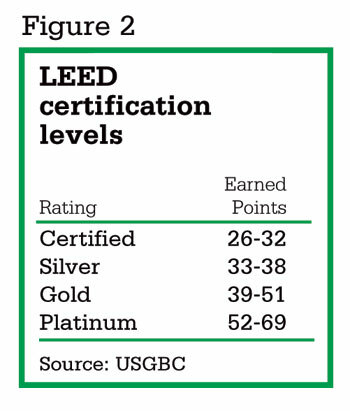 A project that earns enough points (26) can become "LEED Certified," on up the ladder to Silver (33), Gold (39) and Platinum (52 or more). Some categories have prerequisites that must be met or points cannot be earned in that category. Another reason for LEED’s remarkable success is its appeal to Americans’ competitive nature. It takes a complex, multifaceted problem – sustainable design and development – and turns it into a game, with clearly established rules and intricate strategies, where building teams can decide how far they want to go, right up to Platinum, and devise a strategy to reach that mark. LEED has yet another secret ingredient: a branded metric that establishes a means of comparison in the real estate marketplace. The LEED rating imbues projects with the equivalent of the Good Housekeeping seal of approval or a favorable review in Consumer Reports. Since LEED is designed to reflect the best practices of the top 25 percent of new buildings, owners of LEED-rated buildings can state that their properties are, at least in theory, environmentally superior to at least 75 percent of the contemporary buildings in the market. Of course, LEED Silver, Gold, or Platinum status conveys even more prestige. The LEED brand has already become a marketing distinction for a number of certified projects, especially those with Silver or Gold ratings. 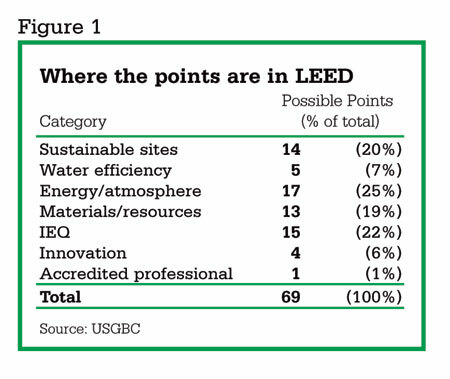 That’s the brilliance of LEED: its simplicity, its competitive structure, its ability to provide a branded metric. The developers of LEED have invented an extremely clever device that has succeeded beyond all expectations. Like the catalytic agent that speeds up a chemical reaction without itself being consumed, LEED has precipitated enormous activity in the real estate community without losing any of its potency. LEED has certainly lived up to its goal to "accelerate the development and implementation of green building practices." At the same time, even the staunchest proponents of LEED would acknowledge that it is an imperfect instrument (which is why it is undergoing an extensive third-generation revision), and the process by which it was developed also has flaws. For example, while it describes LEED as "consensus-based," the USGBC in its infancy purposely excluded trade associations (which themselves function on a consensus basis within their respective industries) from joining the organization, out of fear that trade groups would use their financial resources and lobbying capacity to take over the organization – an understandable concern at the time, but one that no longer applies, given the USGBC’s current stature. A USGBC task force recently held meetings with trade associations seeking admission and environmental groups opposed to trade association membership, with a report anticipated this year. 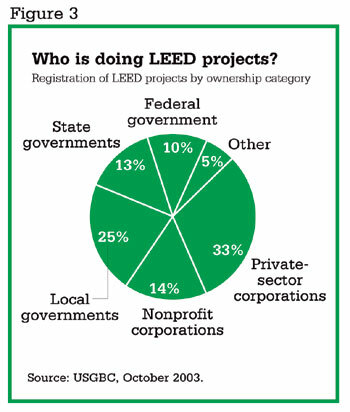 Furthermore, while the USGBC describes LEED as "market-driven," most of the early adopters have been government agencies (federal, state, and local government buildings make up half of the LEED registry), universities, schools, foundations and environmental organizations, which do not operate under the same financial parameters as the speculative commercial real estate market. A number of environmentally conscious corporations have also embraced the program, but they, too, see their investment in more long-range terms that are the case of the speculative market. Finally, while LEED is supposed to produce "the world’s greenest and best buildings," the process does not in and of itself guarantee optimal results. A study by the University of Michigan’s Center for Sustainable Systems, produced under the auspices of the National Institute of Standards and Technology, found LEED wanting: "While LEED appears to be accomplishing the goals of an eco-labeling program that is [successful] as a marketing and policy tool," the authors wrote, "it is not as successful at being a comprehensive methodology for assessment of environmental impacts." 1 (It should be noted, however, that this report analyzed LEED from the perspective of life cycle assessment, a standard to which the early program did not aspire.) Clearly, it takes more than following a checklist to create a well-designed, fully integrated sustainable building. There is also evidence that many first-generation LEED projects went after easy points, the so-called "low-hanging fruit." 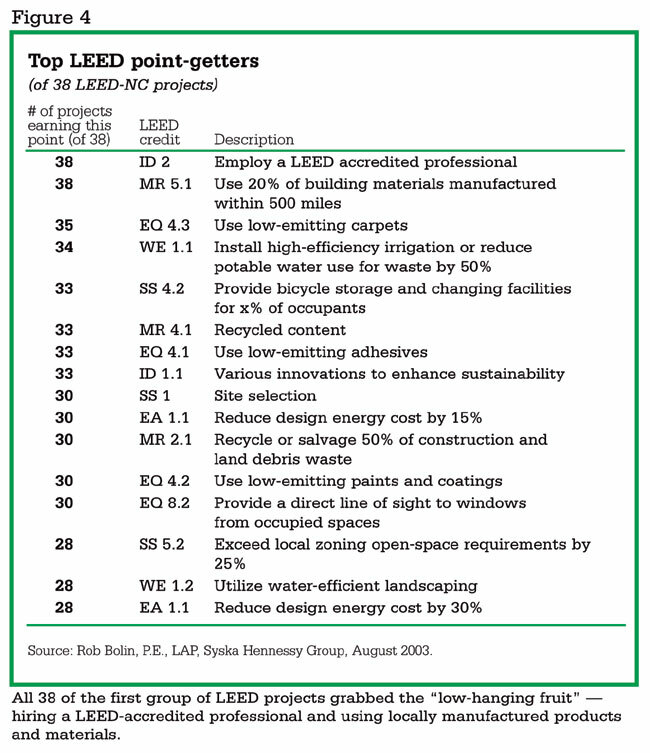 An analysis of 38 early LEED projects (see Figure 4) shows that all 38 got points for hiring a LEED-accredited professional and using locally manufactured materials, but only a few took on more demanding challenges, such as brownfield redevelopment or significant (more than 50 percent) energy reduction (see Figure 5). On the other hand, even just a few years’ experience shows that participation in LEED does encourage design teams to consider a wide range of environmental issues; in the hands of skilled and experienced practitioners, LEED-rated buildings should invariably turn out to be more environmentally beneficial than conventionally designed equivalents. Building teams that take a holistic approach from the start of development, rather than adding LEED elements as an afterthought, can and do produce more fully integrated buildings, often without significant added costs. How to account for regional differences (climate, water, sun, energy resources) in the context of a national program. Perhaps most difficult of all, introducing life cycle assessment into the structure of LEED, so that the long-term performance of building components and the structure itself is given greater consideration than under the current methodology. Research for this effort is already underway with the Life Cycle Inventory study being conducted by the Athena Institute for the National Renewable Energy Laboratory. More and more professional firms will become actively involved in LEED – and sustainable design in general – as a matter of survival. As firms grow in experience, they will form alliances with like-minded partners in other disciplines – design firms with certain contractors, those contractors with certain engineering firms, and so on – to the point where, for many professionals, the practice of sustainable design will become routine and ingrained in their corporate culture. Technologies and products will continue to improve, although in the short term confusion or doubt about what constitutes "greenness" may linger. Product and systems choices should continue to grow richer as the market responds to ever-growing demand from designers, contractors and owners. LEED accreditation and training will, of necessity, become more demanding, as greater emphasis is placed on commissioning to document that the design did indeed produce the intended energy and environmental benefits. Analysis of costs versus benefits will become even more rigorous and extend deeper into long-term building operations, at an increasingly large physical and geographical scale. The demand for "proof of the pudding" will accelerate as LEED and sustainable design become more complex. "We’re selling the promise of a better building, but there has to be a specific causal link, where ‘green building’ equals ‘specific benefit,’" says Alan Traugott, of Flack and Kurtz Consulting Engineers. Clearly, LEED is a work in progress. Nearly a decade ago, the U.S. Green Building Council took up the sustainability flag when more established standard bearers relinquished the field. Today, the organization is in the midst of an almost Herculean effort to raise the performance standards of LEED. It is anticipated that LEED 3.0, scheduled to come before the membership in 2005, will significantly raise the bar on performance standards required of new buildings seeking certification, with greater emphasis on life cycle assessment and keyed to an international standard such as ISO 14001. Looking ahead, LEED will break new ground in commercial interiors; existing buildings; core and shell; and low-rise residential, as well as in specific applications for schools, hospitals, laboratories, retail stores and multi-building campuses. Such a vast and ambitious agenda has inspired thousands of individuals to participate nationally and in more than 20 chapters around the country. 1"Evaluation of LEED Using Life Cycle Assessment Methods," Chris W. Scheuer and Gregory A. Keoleian, University of Michigan Center for Sustainable Systems, September 2002, p. 93. 2"The Federal Commitment to Green Building: Experiences and Expectations," OFEE, Sept. 18, 2003. 3"The Future of LEED," Malcolm Lewis and Nigel Howard, Environmental Design+Construction, July/August 2003. This article is an excerpt from "White Paper on Sustainability: A Report on the Green Building Movement," first published in Building Design & Construction in November 2003. For more information on the LEED Green Building Rating System?, please visit the U.S. Green Building Council’s website at www.usgbc.org. Insulation Outlook welcomes your comments. Contact the editor at editor@insulation.org.